Silica Supplements key point : silica health benefits, what are the benefits of silica? Health benefits of silica in humans. For silica supplement, we strongly recommend water soluble form as it is easily absorbed by human body. There are people who doubt the effectiveness of silica supplements in the form of powder, capsule or other forms, they are right as those forms of silica supplements are difficult to be absorbed by human body. Umo Silica solved this problem. Silicon is one of the most important element among 60 kinds of essential nutrients necessary for body organs and visceral elements, known as the source of life. Silica is also called silicon dioxide. It has been proven by experiments that silicon is mainly present in the extracellular matrix and is one of the elements required for glycosaminoglycans in the connective tissue and relevant protein complexes. Silicon level drops along with aging. It can not be synthesized by the body itself, and it is difficult to absorb from ordinary diet, resulting problems of lack of silica in human body. Once the human body is in deficit of silicon, at first, bones will become crisp, and vascular lipid will be easy accumulated and in retention. There are a variety of symptoms of inadequate silicon, those can be easily observed daily includes: easy to break nails, easy to fall hair, easy to itchy skin and so on. In the past, there was no silica supplement. However people can take in the mineral nutrients required by the body from the groundwater, well water, mountain spring water, or natural river water. In addition, people can also rely on absorbing all kinds of trace minerals from soil and growth of crops for the intake of mineral nutrients required by the body. Silicon is one of the important trace elements for human nutrition. Unfortunately, our common nature has long been polluted in varying degrees of air pollution, surface water pollution, material pollution by the continuous human beings’ destructive behaviors, as such mankind is facing the threat of various diseases and biological extinction. In such an environment, people’s natural source of silicon intake has become more and more threatened for a long time. How to take Silica Supplements? We can not eat those crushed or fragmented rocks directly, no matter how finely the ground crystals are, they can not be absorbed by the body. Over decades ago, Europe and the United States have been drinking powdered silica solution. But for the powder, not only the body can not absorb but also it will increase the burden on the kidneys. For silica supplements, we strongly recommend water soluble form as it is easily absorbed by human body. There are many people doubt the effectiveness of silica supplement in the form of powder, capsule or other forms, they might be true as those forms of silica supplements are difficult to be absorbed by human body. It must be the water-soluble silica, which can be really absorbed by human body. More than a decade ago, Japanese scientists developed the Umo silica – the water-soluble silicon through the process of heating the crude water-soluble silicon crystal at the temperatures of 1650 degree for 8 hours and extracting & collecting of the useful silicon component gas. The Umo silica supplement, water-soluble silicon has about 0.4 nm small molecules, it can quickly penetrate into the cells, has been widely used in a variety of cosmetics. Similarly, after drinking, it can be quickly absorbed by the intestinal tract, digestion and metabolism. Umo Silica is the result of extensive research and development by The Japan Medical Science Institute of Silicon since year 2000 & has been sold in Japan since 2007. Over one billion bottles of Umo Silica were sold in Japan monthly. Umo Silica supplement is 99% active silicon enriched water soluble nutritional liquid. it contains crystal active silicon and other minerals. It is 100% made in Japan. As a nutritional supplement, Umo silica supplement has become one of the indispensable and healthy family drinking products. What are the health benefits of umo silica for human body? Silica removes excess free radicals, has the resistance property to reactive oxygen species, can effectively improve the body’s antioxidant capacity. Reactive oxygen species can lead to acidification of the human body and the acidic constitution is the source of all diseases, cancer cells can only survive in acidic body fluids. Studies have shown that the body’s antioxidant system is a perfect and complex functions system, which is comparable with the immune system. The stronger the body’s antioxidant capacity, the healthier and the longer life the people live. Japanese scientists have found that supplement intake of silicon can increase thymus activity, increase immunity, therefore, have a good effect on allergic dermatitis, allergic rhinitis and other symptoms of immune system disorders. Silica can repair damaged blood vessels, and soften blood vessels, and can clear up the blood lipids, cholesterol and other lipid components accumulated in the blood vessels and excrete them out of the body (detoxification), has very good effects on cardiovascular disease, diabetes, hypertension and heart disease. Silica is known as the “Beauty Inorganic Salt”. It is one of the important skin supplements. 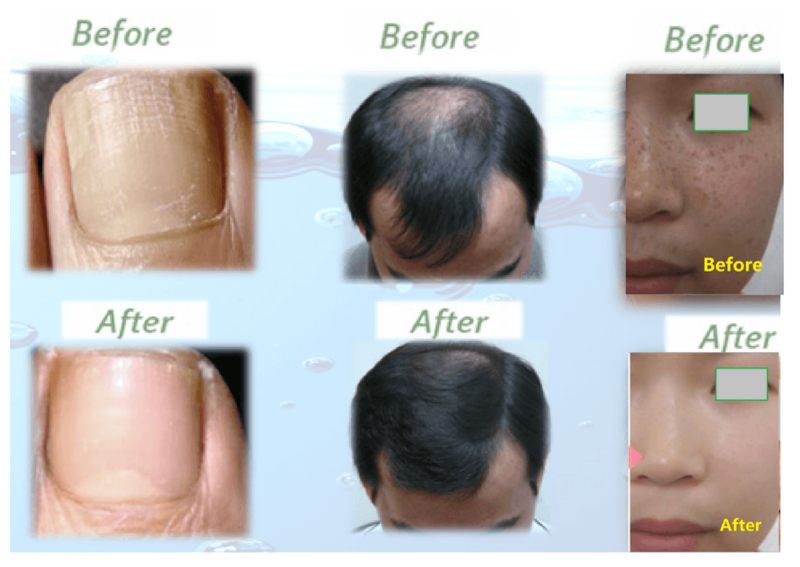 It can make hair shine and beautiful, prevent hair loss and promote hair growth; make eyes bright, and also promote nail growth, and make nail strong. Silicon is one of the essential elements of connective tissue of human skin, it can link the collagen protein chain, make the collagen chain more closely, it makes the skin compact and flexible, and it also stimulates cells to promote cell regeneration, makes skin texture more delicate, anti-acne and anti stain. Eating high-fat foods, then easily being oxidized in the intestine, with food decay in the intestine, it makes the body oxidative. Harmful intestinal bacteria is one of the main causes of cancer. Water-soluble silicon , Umo Silica Supplements can eliminate the risk of intestinal poisoning, can prevent intestinal oxidation, can instantly kill E. coli, Gram-negative bacteria, can prevent abnormal fermentation in the intestine and reproduction of harmful bacteria. – Edward A. Lemmo, Ph.D.
“Silicon Biochemistry,” Ciba Foundation Symposium 121. John Wiley & Sons, 1986. “Silica,” Edward a. Lemmo, Ph.D. Keats Publishing, Inc., 1998.